As the film with the most-watched trailer of all time, Star Wars: The Force Awakens has spawned a plethora of fan-made knockoffs. Some of them aimed for superhero crossovers, while others shoot for something more comedic. This latest one just wants to make your eyes go gaga as much as the original trailer did. 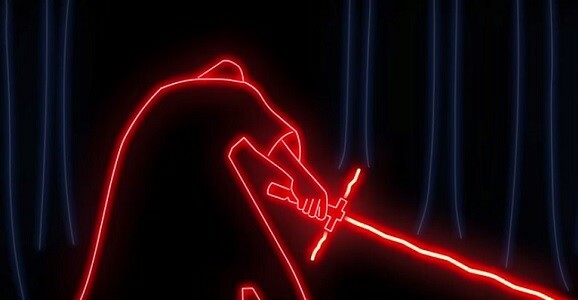 I present to you The Force Awakens…in neon. The only problem, really, is the fact that the teaser trailer doesn’t have that much footage to show us. So yes, we can blame this all on J.J. Abrams, something he’s certainly not used to hearing, right? This just makes me antsy for the full theatrical trailer for Star Wars: The Force Awakens, which will make me equally antsy for follow-up video in neon, which will in turn make me evermore anxious for the film itself, which will lead to wanting to see the whole movie in bright neon lights. (Yeah, this is the guy who made these amazing posters, too.) It’s a deadly new addiction this video has started. Well, maybe not deadly. Luckily, Whaite also created an even greater trailer for Jurassic Park, which features a lot more animation, and a lot more dinosaurs coming close to eating humans. Something the Star Wars franchise just doesn’t know anything about. I can’t be the only person starting petitions to get Samsung producing Neon 4K televisions, right? Maybe they’ll be here by the time Episode IX: Dude, Where’s My Force? comes out. Before that, though, find Star Wars: The Force Awakens in theaters on December 18.